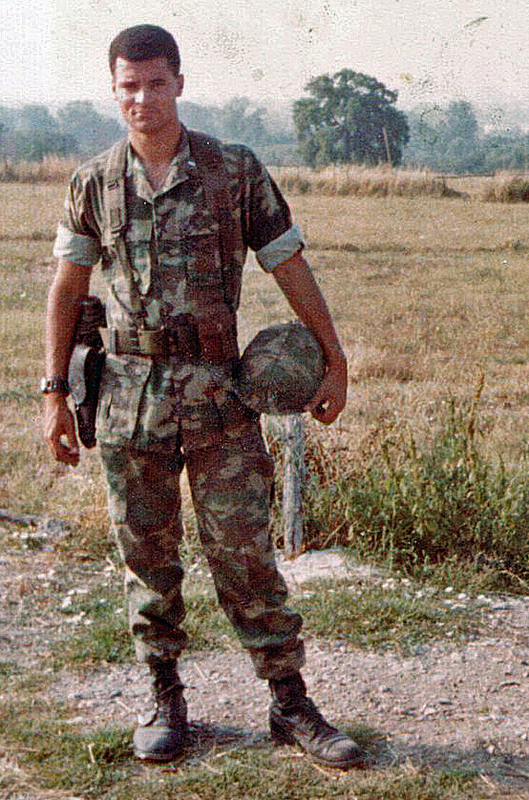 Lt. Col. Kris Roberts served as a facilities maintenance officer at Marine Corps Air Station Futenma in Okinawa, Japan in the 1980s. The horror of Agent Orange and its effects on Vietnam war veterans and Vietnamese citizens is well-documented. But many U.S. veterans who never fought in that war say they, too, handled toxic chemicals at military bases around the world, suffering the same health consequences. Retired Lt. Col. Kris Roberts is among them. The Japan Times first wrote about Roberts, who served as a facilities maintenance officer at Marine Corps Air Station Futenma in Okinawa, Japan in 1981. Roberts says back when he was a First Lieutenant, he was assigned to investigate high chemical readings in water runoff from the base. On the theory that the chemicals were coming from the base fuel farm — a collection of underground fuel tanks — Roberts was ordered to build a floodgate. "We started digging, then we found some barrels," Roberts tells All Things Considered guest host Tess Vigeland. "And then we dug some more, and we found some more barrels and some more barrels. And we ended up finding about 100 barrels just neatly placed. Some of them were old, some of them were brand new, unmarked barrels and some of them were leaking." There were no labels indicating hazardous materials inside, but some had reddish-orange markings. Looking back, Roberts says it might have been rust — or the tell-tale marker of Agent Orange. While he didn't know what the barrels contained, Roberts says he knew something was wrong. He was ordered not to report having found the barrels and was told that other base workers would dispose of them off-site. As Roberts dug them out of the ground, he came into direct contact with the barrels. "We took them out — we had no safety equipment or anything," he says. "Later on, there was a typhoon and the whole area flooded because somebody had closed the [flood] gate. So, there was about six of us that had to submerge ourselves in the water to get the gate open." 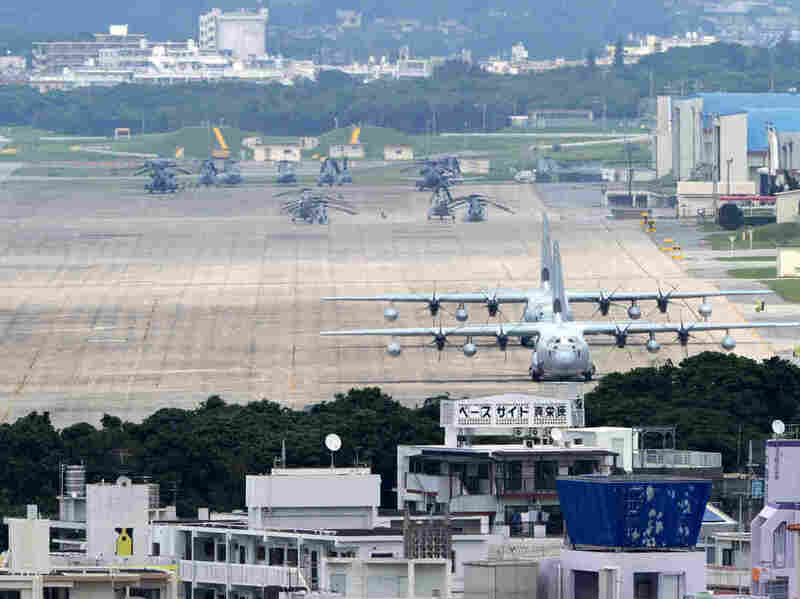 This picture taken on April 24, 2010 shows the US Marine Corps Air Station Futenma base in Ginowan, Okinawa. Within a year of the incident, Roberts began noticing serious health problems. Before Okinawa, he did marathons. After, he found himself blacking out when he'd go on runs and his blood pressure was dangerously high. "I ended up getting a thymoma. Some people call it thymus cancer and I had to have that removed out of my chest," Roberts says. "And then I got prostate cancer. And then blood was pooling in the bottom of my heart that was causing me to have mini-strokes. And then [I had] two strokes. I had to get a pacemaker, and I'm on my third pacemaker." In 2007, Roberts filed a claim to the VA concerning exposure to hazardous chemicals. He says he was certain it had an effect on his rapidly declining health and caused his prostate cancer. Earlier this month, the Board of Veterans' Appeals ruled that his cancer was connected to the chemicals at Futenma Air Base. According to The Japan Times, Roberts is the first veteran known to have won compensation for exposure on Futenma. But the ruling pointedly does not mention Agent Orange. "The veterans who made claims about Herbicide Orange remembered actual events that happened. However, the source documents showed that while these events took place, either the material involved was not Herbicide Orange or the location was not Okinawa. The Department of Defense remains committed to working closely with the Government of Japan on this issue. If in the future we discover any evidence that Herbicide Orange was ever stored on, used in, or transported through Okinawa, we will be sure to share it with the Government of Japan without delay and take appropriate action." Roberts says for him, this case isn't about the money. "I was responsible for the 50 Okinawans and the 35 Seabees that worked for me," he says. "And I felt that I kind of let them down because I put them in this situation." Now, 34 years later, Roberts wants the military to acknowledge the toxins buried at Futenma Air Base and investigate the extent of contamination, including the neighboring city of Ginowan. "They may have problems, their children may have problems, and they may have no idea what caused them," he says. "From my point of view, if you have hazardous chemicals that are deadly to individuals, or causing cancer, people arguing over whether it's Agent Orange or not doesn't solve the problem ... Do the right thing. Look what's happening to the people that were affected by these hazardous chemicals."